Hi,in the light of my earlier postings on this subject and its background I must admit I was unsurprised to find that both Christopher Booker and Richard North would seem largely to hold the same views, though clearly they have expressed them in a more susinct and less verbose manner! Though the style may be different it seems the understanding and belief is the same – this I attribute to the fact that both of them are professional journalists whilst I am but a casual (unpaid) blogger, expressing my views and exposing the criminality and venal nature of some in public office. As the founding editor of Private Eye, Christopher Booker has a better claim than most to judge the nature of satire. 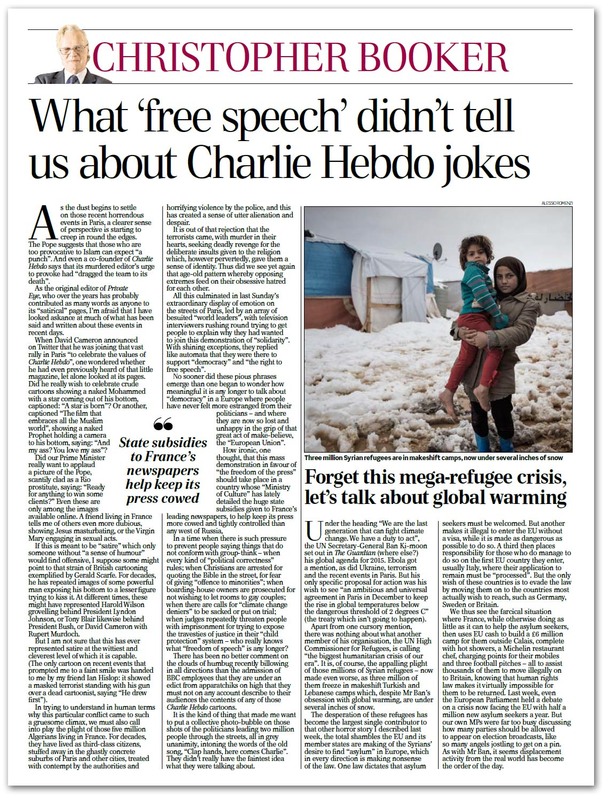 And, in this week’s column, he explores the dark side of Charlie Hebdo, and the events surrounding the recent horrendous events in Paris. As the dust begins to settle on those, writes Booker, a clearer sense of perspective is starting to creep in round the edges. The Pope suggests that those who are too provocative to Islam can expect “a punch”. And even a co-founder of Charlie Hebdo says that its murdered editor’s urge to provoke had “dragged the team to its death”. And it is as the original editor of Private Eye, who over the years has probably contributed as many words as anyone to its “satirical” pages, that Booker has looked askance at much of what has been said and written about these events in recent days. When David Cameron announced on Twitter that he was joining that vast rally in Paris “to celebrate the values of Charlie Hebdo”, one wondered whether he had even previously heard of that little magazine, let alone looked at its pages. Did our Prime Minister really want to applaud a picture of the Pope, scantily clad as a Rio prostitute, saying: “Ready for anything to win some clients?” Even these are only among the images available online. There are others even more dubious, showing Jesus masturbating and the Virgin Mary engaging in sexual acts. If this is meant to be “satire” that only someone without “a sense of humour” would find offensive, some might point to that strain of British cartooning exemplified by Gerald Scarfe. For decades, he has repeated images of some powerful man exposing his bottom to a lesser figure trying to kiss it. At different times, these might have represented Harold Wilson grovelling behind President Lyndon Johnson, or Tony Blair likewise behind President Bush, or David Cameron with Rupert Murdoch. In trying to understand in human terms why this particular conflict came to such a gruesome climax, we must also call into play the plight of those five million Algerians living in France. For decades, they have lived as third-class citizens, stuffed away in the ghastly concrete suburbs of Paris and other cities, treated with contempt by the authorities and horrifying violence by the police, and this has created a sense of utter alienation and despair. It is out of that rejection that the terrorists came, with murder in their hearts, seeking deadly revenge for the deliberate insults given to the religion which, however pervertedly, gave them a sense of identity. Thus did we see yet again that age-old pattern whereby opposing extremes feed on their obsessive hatred for each other. All this culminated in last Sunday’s extraordinary display of emotion on the streets of Paris, led by an array of besuited “world leaders”, with television interviewers rushing round trying to get people to explain why they had wanted to join this demonstration of “solidarity”. With shining exceptions, they replied like automata that they were there to support “democracy” and “the right to free speech”. No sooner did these pious phrases emerge than one began to wonder how meaningful it is any longer to talk about “democracy” in a Europe where people have never felt more estranged from their politicians – and where they are now so lost and unhappy in the grip of that great act of make-believe, the “European Union”. How ironic, we thought, that this mass demonstration in favour of “the freedom of the press” should take place in a country whose “Ministry of Culture” has lately detailed the huge state subsidies given to France’s leading newspapers, to help keep its press more cowed and tightly controlled than any west of Russia. In a time when there is such pressure to prevent people saying things that do not conform with group-think – when every kind of “political correctness” rules; when Christians are arrested for quoting the Bible in the street, for fear of giving “offence to minorities”; when boarding-house owners are prosecuted for not wishing to let rooms to gay couples; when there are calls for “climate change deniers” to be sacked or put on trial; when judges repeatedly threaten people with imprisonment for trying to expose the travesties of justice in their “child protection” system – who really knows what “freedom of speech” is any longer? There has been no better comment on the clouds of humbug recently billowing in all directions than the admission of BBC employees that they are under an edict from apparatchiks on high that they must not on any account describe to their audiences the contents of any of those Charlie Hebdo cartoons. It is the kind of thing that made Booker want to put a collective photo-bubble on those shots of the politicians leading two million people through the streets, all in grey unanimity, intoning the words of the old song, “Clap hands, here comes Charlie”. They didn’t really have the faintest idea what they were talking about. number with-held calls are blocked & calls are recorded.